Playing Lean is now even better! Alexander Osterwalder, inventor of the ‘Business Model Canvas’ and one of the great minds of ‘Lean Startup’ has helped create Playing Lean 2. The following video is the Playing Lean 2 – Kickstarter campaign video. Playing Lean 2 has arrived ! Each team makes strategic decisions around which experiments to run and how to develop their startup via: Building Product Features, Testing the Market, Selling and Increasing their Technical Capabilities. The actions of other teams and unexpected outcomes causes players to re-evaluate their decisions and strategies throughout the game. The game typically takes 2.5 hours to complete. BIGJUMP was the first to officially introduce Playing Lean to Australia in 2016, when Bruno Pešec visited Brisbane and shared his experiences. In 2017, Joeri (Yuri) became a Certified Playing Lean Facilitator. BIGJUMP continues to work closely with the creators of the game Simen Fure Jørgensen, Tore Rasmussen, Bruno Pešec and Holger Nils Pohl. Play the Game! At various locations and times around Brisbane sessions are open to our Lean Business Strategies Members. Maximum of 16 players per game. Play the Game and Learn the Theory! Half day workshops that will cover the following: Lean Startup Theory, Playing Lean Game Session, Reflection and Discussion. Maximum of 12 – 16 participants. In-house workshops are available. Playing Lean has received strong global endorsement from leaders in the Lean Startup Community. 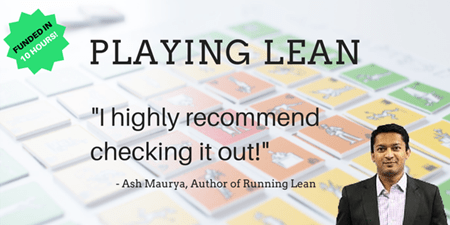 Ash Maurya, Author ‘Running Lean’. Alexander Osterwalder (left), inventor of ‘Business Model Canvas’ & ‘Value Proposition Canvas’ and is considered as one of the great minds of ‘Lean Startup’. Dan Toma (right), Corporate Innovation Expert and Co-Author of award winning book ‘the Corporate Entrepreneur’. Both have helped create Playing Lean 2.